Lotuses are a rare feature here – their reputation is for being needy, their exotic status makes them rare, and some of the more affordable models suffer from questionable aesthetics. In fact, the most likely way you’ll find a Lotus here is under the hood of a Jensen Healey, in the form of the 907 engine. However, for today we’ve got a full-on Lotus for you, in the form of a four-place GT with wedgy, fastback styling that epitomizes some of the design and aerodynamic trends of the time. 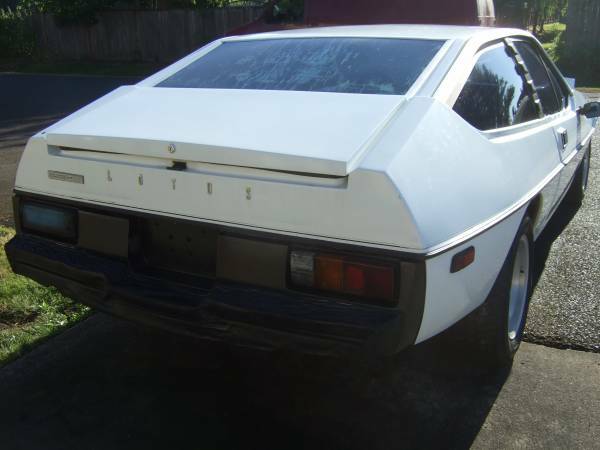 Check out this 1979 Lotus Eclat for sale for $3500 somewhere in southern Washington near Portland, OR. Wow, the white paint really shows the rust-free state of this sweet… wait, what? Well, since Lotus used felt between the body and frame, which was a particular problem in damp climates, you’ll want to make sure it’s all free of crispiness. It’s rather hard to tell whether the pictures are washed out or the paint has gone flat with age, but with a fiberglass car a less-than-new paintjob is actually good so you can see if there are any stress fractures. This is said to be a higher-spec car with leather seats and 14-inch wheels. It was intended to compete with similarly-priced (at about $28,000) cars like the Mercedes SL and Alfa Romeo Montreal, and was intended to move Lotus out of the realm of kit car makers. The Eclat’s engine was said to put out 160hp, and this seemingly desmogged version should be close to that number. The car has had significant work to its engine as well as the electrical, cooling and braking systems. 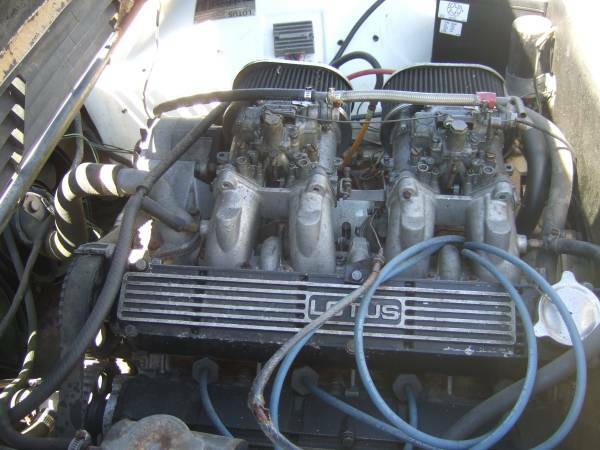 However, it has not run in several years and as such will at least need the cheap insurance of a timing belt, a rebuild for its Dellorto carburetors, and probably some new hoses and a thorough cleaning of all grounds. It’s also said to need new carpets and headliner, along with attention to the leather seats, wheels, bumpers, and probably more. In these pictures, the white-on-black scheme suits the car well, and the trim looks to be in good shape. Here’s why these cars work well as occasional family drivers – the hatch allows you to get away with luggage for three or four. The Eclat was actually an evolution of the Elite, with less bizarre styling to attract more mainstream buyers. In some ways, this British (Oliver Winterbottom) styled car is very similar to an Alfa Romeo Alfetta GT, only with less weight and more power – perhaps they’d have been more successful competing in a more accessible segment, though there were plenty of manufacturers putting out good product in both sports coupes and luxury GTs. Assuming the seller has documentation to back up his claims of thousands spent on repairs, what would you spend on this to bring it home? Or would you just give the seller your money and go home without the car, saving yourself some heartache in the process? This entry was posted on August 13, 2014 at 11:35 pm and is filed under Feature. You can follow any responses to this entry through the RSS 2.0 feed. You can leave a response, or trackback from your own site. welcome back! 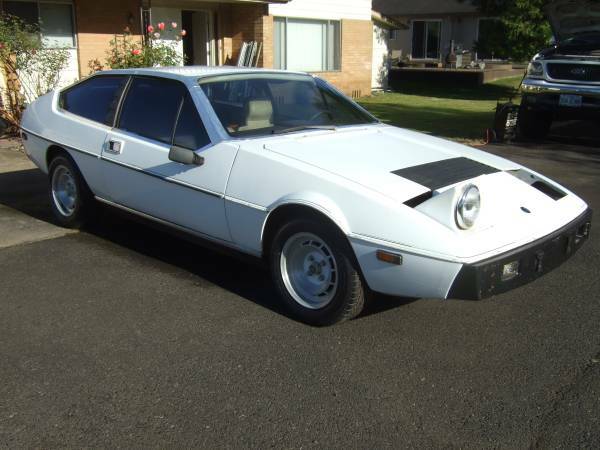 I can understand why this car is so rare; it’s dreadful looking and it came with Lotus build quality & dependability. I don’t mind the looks – if anything, it’s a bit of a bland wedge. And the quality…. well, if you drive anything from the plastic-70s era except maybe a W123 Mercedes, you’ve kind of given up on that already! I kinda like it but I’m not a masochist. Also, reading that ad gave me a headache.